Hi Friends: It's time for a new challenge over at the SheepSki Designs Challenges Blog! The theme for this month is Flower Power. Print image onto smooth white cardstock and color with Spectrum Noir markers. Add glitter brush pen to flowers and let dry. Cut focal image with stitched rectangle die. Cut patterned papers to fit A2 card base, ink edges, and glue to card. Cut next size stitched rectangle from coordinating patterned paper, ink edges, and glue focal image to center. 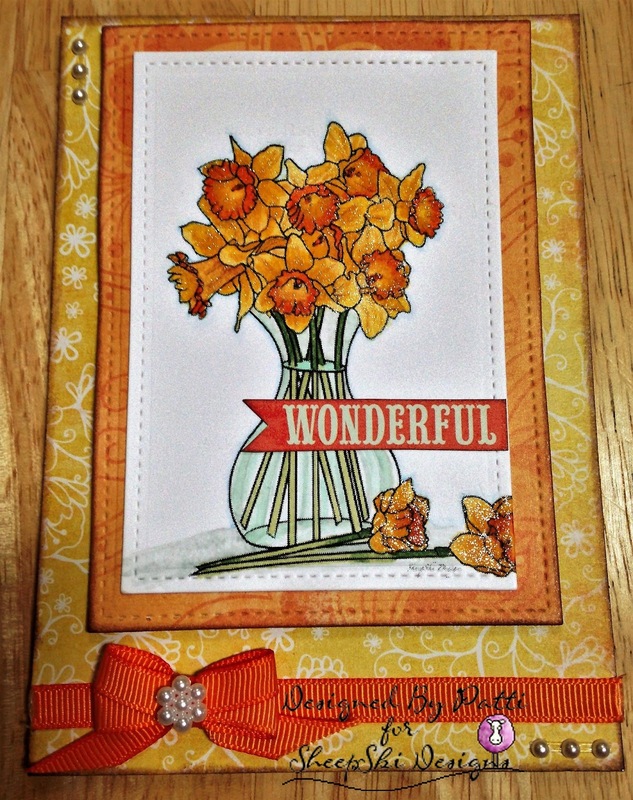 Cut "Wonderful" banner sentiment from the patterned paper sheet, ink edges, and glue to focal image as shown. Glue focal panel to card front, using craft foam for dimension. Finish with ribbon, double bow, and pearl accents as shown.